This IBM Redbooks publication covers the planning and implementation of FICON channels, operating in FICON native (FC) mode for the IBM zSeries and 9672 Generation 5 (G5) and Generation 6 (G6) processors. It discusses the FICON and Fibre Channel architectures, terminology, and supported topologies. 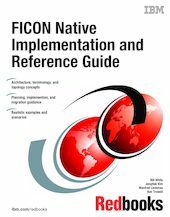 This book provides information about FICON native system setup, availability and recovery considerations, and migration recommendations. You will find examples of the z/OS and OS/390 definitions required to support FICON native control units, FICON Channel-to-Channel (FCTC), and FICON Directors (including cascading), as well as migration scenarios for control units using ESCON (CNC) channels or FICON Bridge (FCV) mode channels to FICON native (FC) mode channels. This book is intended for system programmers, hardware planners, and system engineers who will plan and install FICON native (FC) products in a zSeries and 9672 Generation 5 (G5) and Generation 6 (G6) environment. A good background in systems planning, hardware and cabling infrastructure planning, and I/O definitions (HCD or IOCP) is assumed.